We show that if the inflaton has a non-minimal coupling to gravity and the Planck scale is dynamically generated, the results of Coleman-Weinberg inflation are confined in between two attractor solutions: quadratic inflation, which is ruled out by the recent measurements, and linear inflation which, instead, is in the experimental allowed region. The minimal scenario has only one free parameter — the inflaton’s non-minimal coupling to gravity — that determines all physical parameters such as the tensor-to-scalar ratio and the reheating temperature of the Universe. Should the more precise future measurements of inflationary parameters point towards linear inflation, further interest in scale-invariant scenarios would be motivated. BICEP2 collaboration, P.A.R. Ade et al., Detection of B-mode polarization at degree angular scales by BICEP2, Phys. Rev. Lett. 112 (2014) 241101 [arXiv:1403.3985] [INSPIRE]. M. Rinaldi, L. Vanzo, S. Zerbini and G. Venturi, Inflationary quasi-scale invariant attractors, arXiv:1505.03386 [INSPIRE]. CMS collaboration, Observation of a new boson at a mass of 125 GeV with the CMS experiment at the LHC, Phys. Lett. B 716 (2012) 30 [arXiv:1207.7235] [INSPIRE]. ATLAS collaboration, Observation of a new particle in the search for the Standard Model Higgs boson with the ATLAS detector at the LHC, Phys. Lett. B 716 (2012) 1 [arXiv:1207.7214] [INSPIRE]. N. Okada and Q. Shafi, Observable gravity waves from U(1) B−L Higgs and Coleman-Weinberg inflation, arXiv:1311.0921 [INSPIRE]. D. Croon, V. Sanz and E.R.M. 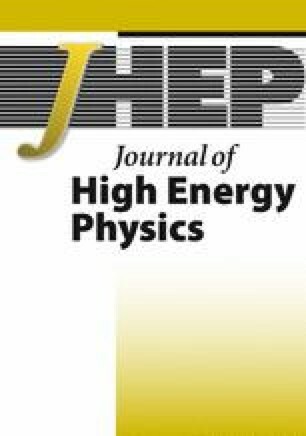 Tarrant, Reheating with a composite Higgs, arXiv:1507.04653 [INSPIRE]. N. Okada, V.N. ¸enoğuz and Q. Shafi, The observational status of simple inflationary models: an update, arXiv:1403.6403 [INSPIRE]. BICEP2, Keck Array collaboration, P.A.R. Ade et al., BICEP2/Keck Array V: measurements of B-mode polarization at degree angular scales and 150 GHz by the Keck Array, Astrophys. J. 811 (2015) 126 [arXiv:1502.00643] [INSPIRE]. D. Escobar, A. Landete, F. Marchesano and D. Regalado, Large field inflation from D-branes, arXiv:1505.07871 [INSPIRE].